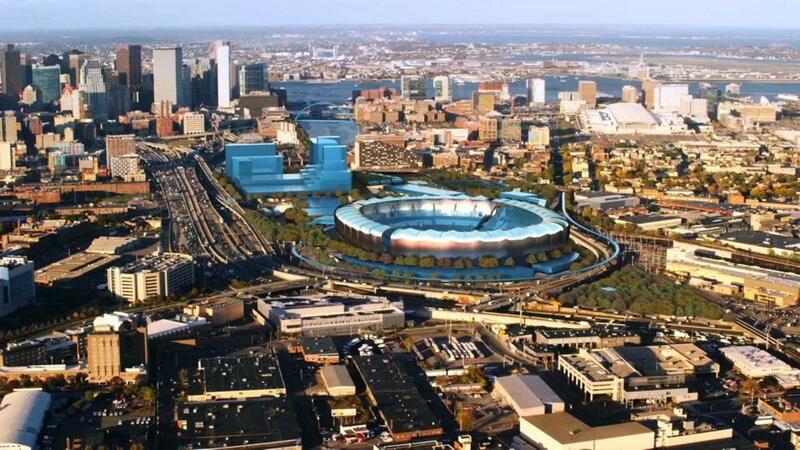 ^ the proposed stadium : can’t the 2024 committee at least talk to those who own the land ? And do it now ? In northern Syria, the Kurdish city of Kobane, two armies are fighting for control of every block, almost every house, stubborn, resistant. Looking at the lines drawn by proponents and opponents of bringing the 2024 summer Olympics to Boston, I almost see the same battle blooming. To both sides — the Boston2024 committee and the “no Boston Olympics” group — the conflict seems a fight for control of the land, the ground upon which Boston is built. Land use is, and for my entire adult lifetime has been, with the exception only of the years of school segregation and busing, the city’s single most contentious issue. One side wants no change at all, as if we lived in a museum stuck in a time warp; the other side wants all the change it can dream of, knowing that what is, is far from ideal and that we can do better. Between the two sides there is no overlap, only uneasy compromise never fully accepted. And so it is as we move toward hosting the 2024 summer Olympics. It being a battle, the two sides do not scruple to steal an advantage. Much has been said, with justice, about the Boston2024 committee’s haste, its unreadiness to open up extended public discussion or even private, landowner talks. (For example, today’s Boston Globe reports that the 2024 committee has not made known its plans to owners of land on which it proposes to erect some Olympic sites.) This is not smart. The “noBostonOlympics” people too want to game the process. They charge, without any evidence, that the games will cost Boston taxpayers billions of dollars. they opine that the city should improve its schools, not “host a three week party: — as if an A-list City cannot do both. They also want to be bringing of the Games to Boston to be yes’d or no’d by citywide referendum — as if the election of Mayor Walsh, whose full commitment to the Games has brought Boston2024 this far, were not referendum enough. Unfortunately, the “noBoston” demand arises from a ready precedent : the State’s new casino law provided for community approval by referendum. Who could have gusssed that that provision would have a shelf life ? Undermining the power of elected government to govern empowered by that election ? Yet here we are. there will now probably be a referendum on whether or not Boston should pursue the 2024 Olympic games. An argument opposite is hard to make, given the casino law. As for who are the people of ‘NoBoston,’ should it surprise anyone that it overlaps notably with the “no casino” people ? Opposing the casino law were two interest groups : first, those who objected to casinos on moral grounds and felt that they had a right to tell the rest of us how we can or cannot spend our money, and, second, people who disliked the added traffic, commotion, and public safety costs that casinos seemed to portend. Almost the identical objections are being adduced to spurn the 2024 Games. After much to-do and no fewer than two referenda, the casino law was upheld and the Boston region license awarded. Big change will poroceed, tall buildings will be built, many jobs will be filled, much traffic, commotion, and entertainment will make Boston a very busy busy place. All of the above will arise in Boston on a much, much larger scale if Boston 2024’s plan succeeds. Think stadium, housing, visitor accommodation, transportation infrastructure, pedestrian walkways, games and activities all over the Metro Boston area and beyond, an Olympic village, and thousands of security people on site during the Games’ three weeks and probably well before them. The plan itself creates huge change. Not since the 1950s has Boston been given over to such an extended urban plan. The 1950s plan had many features that unjustly overrode neighborhoods, with bad consequences for some, and unhelpful impacts on most others. The plan never amended and thus became obsolete long before its completion; as a result, it wasn’t completed — thank goodness. That the Boston2024 committee includes two of Boston’s wealthiest and most politically astute entrepreneurs provides opponents a separate line of attack : plutocrats versus the people. Never mind, I guess, that John Fish and Dan O’cvonnell are, to me, role modles of what successful, city-progressive entrepreneurship must be if a city is to thrive and throb with life rather than calcify. The 2024 Olympics plan must confront as well as inspire. It needs to flex, divert, alter itself as needed. We’re nine years away from the games. In that time Boston will change enormously. The population will be quite different, too. So will the technology. For that reason alone, extended public discussion may flourish. The City must encourage it. But with two caveats : first, there should not be a referendum on the fact itself; and, second, both committee members and attendees at public discussion should b e open to adjusting the plan in line with changes in Boston’s population, economy, and social life. Public discussion must operate as a species of diplomatic talks in which those who want to change every neighborhood of Boston block by block negotiate with those who want no change. Between stability and dynamism there’s scant common ground. Everything that already is has supporters vested economically or habitually — or both — in its continuing to be. That is why “change is difficult,” as Bboston school superintendent John McDonough says so cogently at every meeting in which his reorm o the Boston school district edges ahead — without referenda, please note. Boston2024 needs a John McDonough somehwere in its mix : a voice as gentle as his or her reforms are momentous and as patient as the proposed changes hurry us into the future.